A UniformGrid will normally lay out its child elements from left to right, starting in the first row (top to bottom, left to right). You can reverse the left-to-right behavior by using the FlowDirection property. The default value for FlowDirection is LeftToRight. 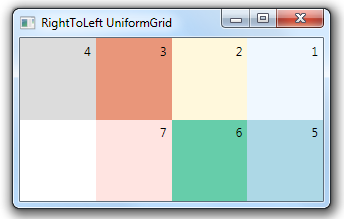 If you specify a value of RightToLeft, the UniformGrid will fill child elements from right to left within each row. (Rows are still filled from top to bottom).